Two benchmarks have been done, one from YouTube, another from MUSCLE-VCD-2007 challenge. 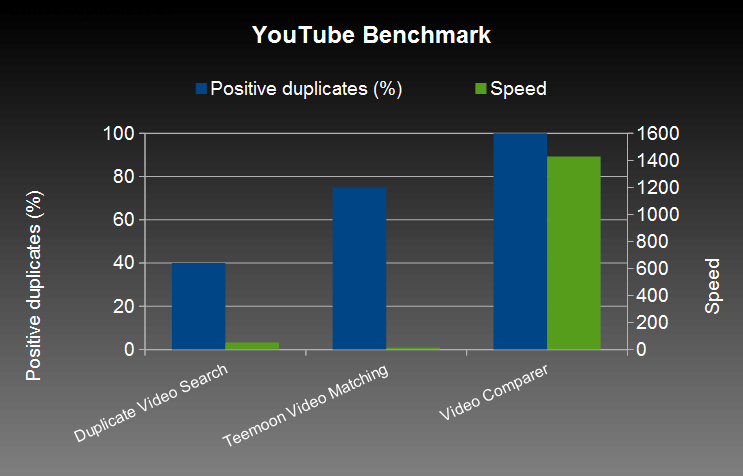 Benchmarks compare the result of different softwares (Duplicate Video Search, Teemoon Video Matching, Video Comparer) and publications. The videos used for this benchmark have been downloaded from YouTube. 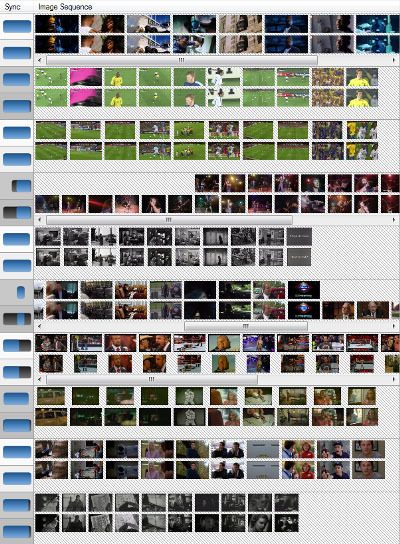 This database contains 98 video clips of a total length equal to about 55 hours. The content of these videos are very various (cartoons, old movies, short movie trailers, sports). The source of video pairs is the same, but the image format, codec, time offset, duration, may change. Teemoon Video Matching (1.0.5): Default. Duplicate Video Search (16.0.0): Video indexing to 100s, Skip first to 180s, Max shift to 30s. Video Comparer (1.04.004): Thorough scan mode. 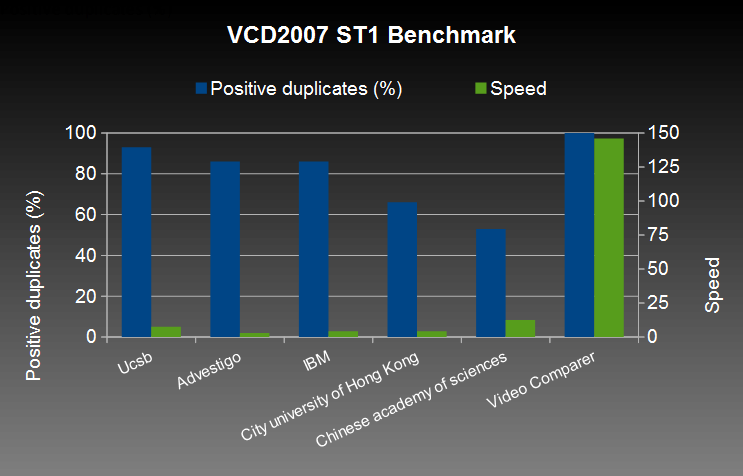 The video database used for this benchmark is MUSCLE-VCD-2007. This database is very interesting for performance comparison, because many teams have developed algorithms and published their results. The large database DB-MPEG1 is learned. This database contains 101 video clips of a total length equal to about 80 hours. These video clips come from several different sources such as the web video clips, TV programs and movies. They cover a wide range of categories, including movies, commercials, sports games, cartoons, etc. The query database ST1Queries is processed. There are 15 query video clips with a total length a little more than 3 hours. Ten query video clips are attacked by one or more changes, or transformations while the remaining five video clips were not from the database. The transformations includes re-encoded, noised, or slightly re-edited.